This leaflet is for ‘J. 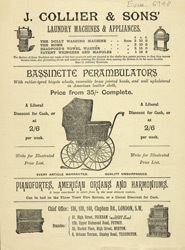 Collier & Sons’ who sell a range of goods such as perambulators, sewing machines, organs, mangles and washing machines. All these items were seen as labour saving devices and would have been very popular with the middle classes who had money to spend improving their homes. They would also have been status symbols and owning a pram or washing machine was a way of demonstrating the families prosperity to their friends and neighbours.